Thinking about getting a dog, cat, guinea pig, or any other kind of pet? Do it — and if you need any reason beyond the animal’s cuteness to convince someone you live with, try one of these eight health benefits that can come with pet ownership. A potentially longer, healthier life should make up for all those chewed-up shoes, pooper scoopers, and hairballs, right? 1. More physical activity: It probably doesn’t come as a surprise that owning a dog requires a little bit of energy. Dogs have to be walked and exercised, which means dog owners are out there getting more physical activity than people without dogs. Older people are more likely to take regular walks with a dog than they are with a human, according to one study. Another found that 60 percent of dog owners who took their dogs for regular walks were considered to get regular moderate or vigorous exercise based on federal standards. 2. Less stress: Sure, it can be stressful to have pets when you’re afraid one might be sick or you can’t figure out how to get them to stop breaking your blinds, but overall, pets are known to reduce stress. Cortisol is a hormone activated by stress, and studies have found that being around animals can decrease cortisol levels. For this reason, many offices are starting to allow employees to bring dogs to work, and some universities are letting students borrow dogs during stressful times of the year. 3. Lower blood pressure: Can you feel your blood pressure start to rise when stress creeps into your life? Along with medications and lifestyle changes, a pet can help with hypertension. A study of stockbrokers found that having a cat or dog helped lower the spikes in blood pressure that happen when a person is stressed. Another study of hospitalized heart patients found that dogs decreased the patients’ blood pressure by about 10 percent in the left side of their hearts. 5. 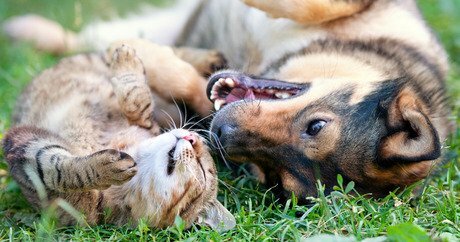 Alleviate depression: You’ve probably realized that your pets can make you smile when you’re just feeling a bit down, but even those of us suffering with diagnosed depression can reap these mood-lifting benefits. The National Institute of Mental Health recognizes animal-assisted therapy as a treatment for depression and other mood disorders because pets can have a positive effect on depression in a number of ways. A pet requires its owner to remain active and can help him or her feel less isolated from society. A pet also remains a trusted companion, even when its owner withdraws from friends and family. 6. Allergy prevention: A seven-year study of almost 500 children found that children who were exposed to dogs and cats as babies were half as likely to have allergies and risk factors for asthma as they grew up than those who had no pets. Infants with more than one pet in the home had the lowest risk of allergies. So even though you might have to be cautious with pets around babies to make sure the pets don’t become aggressive with them, having those pets around could benefit your child in the long run. 7. Low blood sugar detection: If you have diabetes, you know how dangerous a drop in blood sugar can be. While many people have their blood sugar under control, those who often have unexpected changes could get a life-saving health benefit from having a dog. There are specially trained dogs who have been taught to detect drops in blood sugar by smelling. When they smell a change, they can alert the person before it becomes dangerous. 8. Less risk of stroke: This must be payment for the number of times you’ve had to clean out that disgusting litter box: owning a cat cuts a person’s risk of having a stroke by more than a third. Researchers theorize that petting a cat can lower stress or that the type of people who own cats are more stress-free naturally. Whatever the reason, you should probably go adopt a pet just to be on the safe side.